With Marty on the bow peering into the darkness, we tentatively approached the harbor entrance while trying to determine where the rocks of the breakwater and the nearby reef ended and the narrow channel began. It was a final moment of angst in a passage that had been full of adrenaline rushes. Neither of us had gotten much, if any, sleep, so we were looking forward to tying up to a dock and closing our blurry eyes! 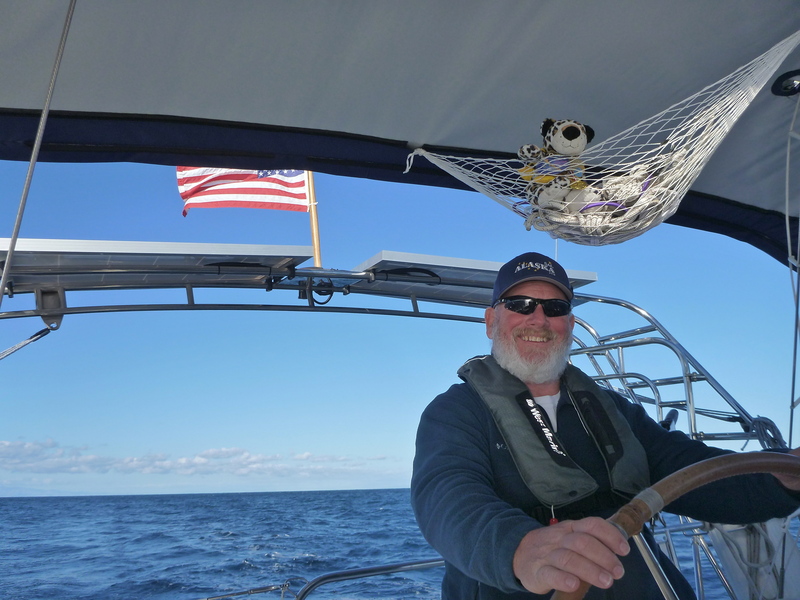 Forty hours earlier we weighed anchor at 4am and set Otto (the autopilot) on a course heading of 100 degrees, from Ensenada de los Muertos, on the eastern edge of the Baja cape, toward Mazatlan, on the western shore of Sinaloa, Mexico. We planned on making the 200 miles in 32 to 34 hours, depending on our cruising speed. The winds were forecast to be moderate from the NE for the first day, and moderate to strong NW for the remainder of the trip, with a low 2′-4’ swell, which would have provided us with an easy point of sail the entire trip, allowing us to arrive in Mazatlan before dark. The first 3 or 4 hours from Los Muertos (bay of the dead), there wasn’t any wind to speak of so we motored over smooth seas while watching a beautiful sunrise. When the wind finally arrived we hoisted the sails and turned off the iron genny. With the winds from the NE, we were able to set the sails on a close reach (with the wind coming across the boat just forward of the mast) while maintaining our course heading perfectly. These are the sailing days that we look forward to; enough breeze to keep the boat moving along briskly, sunshine to keep us warm, and a light sea swell to push us along. Perfect conditions for a long crossing! A little blusterly now, but still relatively smooth.. Unfortunately, it didn’t take long for those light breezes to build into a gusty blow, with the seas getting messier by the hour. By noon the main swell was coming out of the North, pretty much right on our beam and causing us to roll deeply into the troughs of the waves, which isn’t very comfortable. We changed our course heading a few degrees more to south to keep the growing swell on our port quarter (aft of the mast) so that it would push us along rather than roll the boat from side to side. With the sails reefed down and the angle of the swells slightly astern we were able to zip along fairly comfortably. The seas kept building and the winds never shifted to the NW as expected so we had to deal with winds from the NE, a swell from the N and another from the NE, and it wasn’t looking good. The winds were only in the low 20’s, but it was the heavy, steep sea that was giving us the biggest challenge. As the seas built it was getting more and more difficult to keep the boat from heeling wildly as the waves hit us on our beam. Add to that a separate swell coming from astern and every now and again the two swells would hit together, causing the stern to lift up high and get tossed to starboard for the slide down the wave, throwing us uncontrollably abeam to the wind. There were a few E-ticket rides in there that I don’t need to do again! By hand steering and continuing to point further south, we were able to keep Happy Dance from getting into serious trouble, though it was very tiring to watch the waves and steer out of the worst of them. As darkness fell, we realized it was going to be impossible to maintain our heading safely since we could no longer see the 6’-8’ swells coming at us every 4-6 seconds. We now had a triple reefed mainsail and the storm jib out. We changed course to 162 degrees, or SSE. Mazatlan was pretty much due east by now, so we were quite a bit off of our preferred course, no longer heading toward land; we were simply riding the waves out of the Sea of Cortez toward the Pacific Ocean. The concern about that was that we didn’t really expect the conditions to lighten up until we got closer to land. In other words, it was getting serious (and yes, a bit scary) and we were about 100 miles off shore in either direction. We did see a few whales though, so it wasn’t totally without encouraging moments! Once we’d altered course to put the swells on our stern the ride became more bearable. 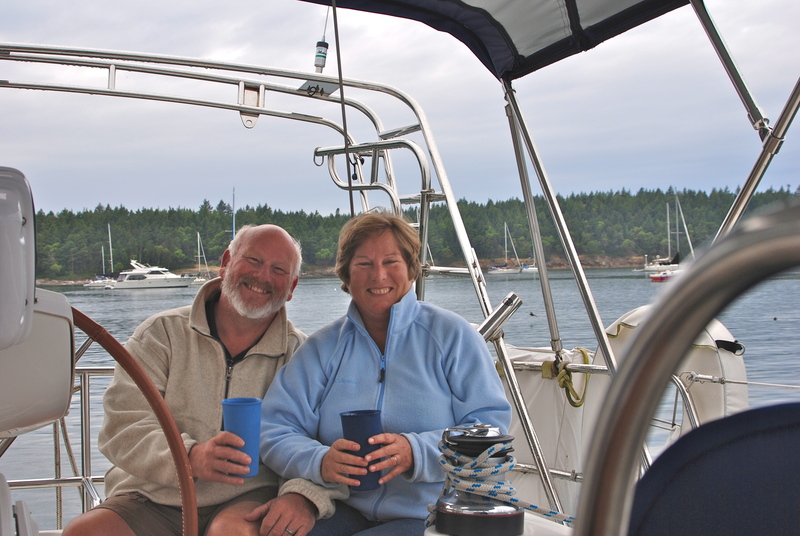 We shortened sail a bit more by taking in the mainsail completely and reefing the storm sail. 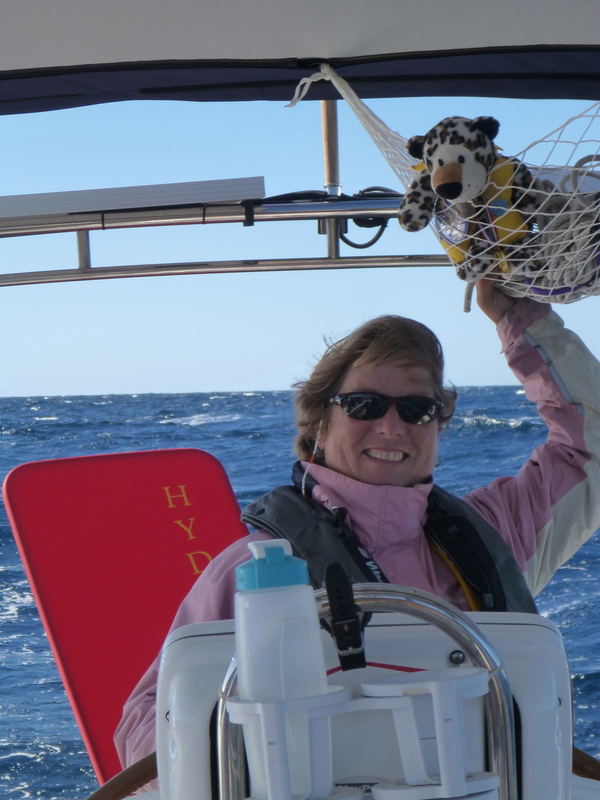 Then we set up Hydie the Hydrovane (the auto pilot while under sail) to do the driving. 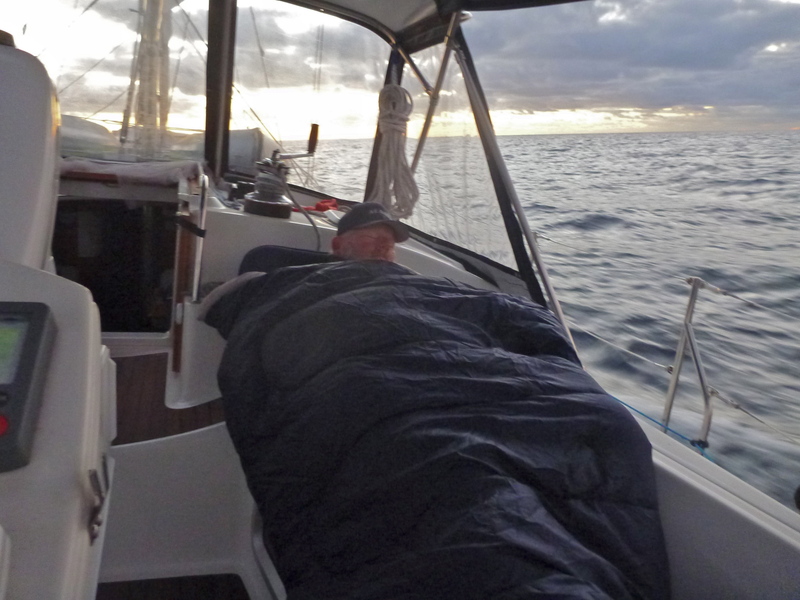 We took turns at the helm, with one of us watching the wind direction to make sure Hydie kept the wind and waves astern while the other wrapped up in a sleeping bag to “sleep” in the cockpit. I’m not sure which job was the more difficult in those rolling seas! Needless to say, it was a rather long night. Thankfully a nearly full moon helped to shed some light on the subject, bathing the sea in silver and giving us a better view of the sea state. The swells were becoming more consistent and were lying down slightly, so around 3am we finally decided to try to turn east again and ride the swells and troughs. The winds were also lessening a bit, so we added sail and changed course to 90 degrees (due east), and off we went. Once again it required us to hand steer to keep the boat traveling straight through the swells, but it allowed us to get back on course. By sunrise things were slowly calming down until finally at noon we had to turn on the engine and we could also turn on the autopilot. During the day we saw 4 huge sea turtles swimming by the boat, 2 schools of dolphins on the bow, some humpbacks, and a bazillion flying fish. 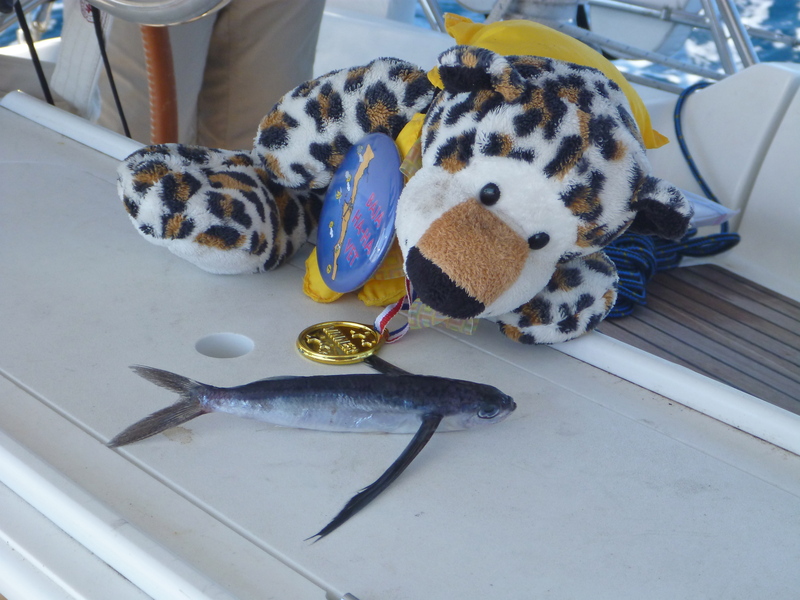 We even had one flying fish make a crash landing on Happy Dance! 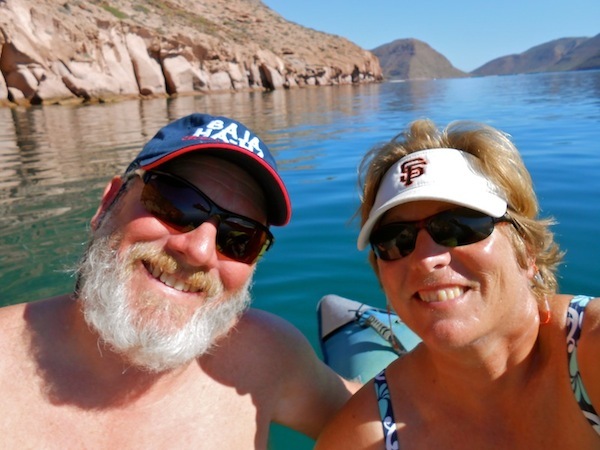 We were able to keep on course toward Mazatlan and the miles slowly, very slowly, ticked off. Sunset found us about 40 miles away, so darkness caught us as we headed into the harbor. It was a confusing entrance trying to pick out the white reef marker, and the red and green channel markers from all the lights of the city and the Christmas lights! We made it though, and were soon tucked into our bunk where we didn’t move for 13 hours. We’re now enjoying a quiet Christmas in our Happy Dance while tied to the dock in the Mazatlan Marina. We had thunder and lightening and rain all night and Santa didn’t seem to find us, but no problem! It’s a beautiful sunny day, the coffee is hot, and the day is ours. The provisions are a little low, but nothing says Merry Christmas like Spam and pancakes along with a mango mimosa..ha! We are happy, healthy, and having the time of our lives. It’s been a fantastic 2013 and we’ve no doubt that 2014 will continue to be full of adventures and smiles with a few more adrenalin rushes thrown in for good measure! Water so clear you can snorkel from the kayaks..ha! 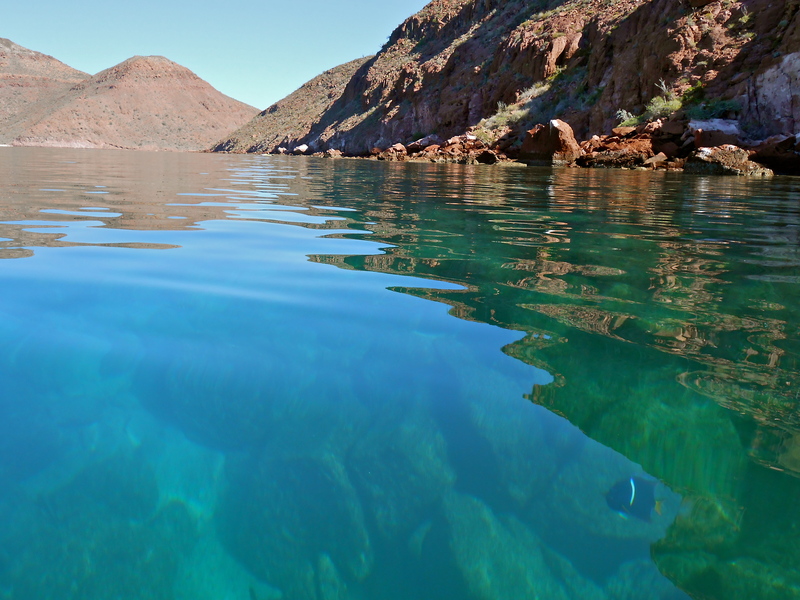 One of our beautiful days spent in the Sea of Cortez…before the Northers! Glad you made it safe and sound. I was on the edge of my seat reading that blog. Great stuff, but scary even from here. Say hello to my old favorite dig, Senor Frog’s!! Merry Christmas and Happy New Year, or Feliz Navidad y Prospero Ano!! !